This is an active plush toy. Auto shake and makes sound that attract dogs to hunt and have fun with it! 1. Open the velcro of plush cover, take out the ball device. 2. Remove the insulating strip. 3. Press the button and shake aggressively to activate the device. (If it doesn't activate press the button and shake again). 4. Put the ball back into the plus cover. 5. The ball will jump and squeak and activate automatic stop after 20 sec. 1. Unscrew 2 screwers on the back side of the ball device (there are 2 arrows pointing to where the screwers are) by a small cross-head screwdriver. 2. Find the battery case on the side with open/close mark (NOT the side with speaker). 3. Remove the screw locking the battery case cover (only one screwer). 4. Install the batteries (3 X AAA), lock the battery case cover back. 5. Screw back the back side of ball device, put the ball device back into the plush cover. Watch your pet when playing! Be careful not to swallow by your pet! NO throwing or chewing! Only moving on the floor. 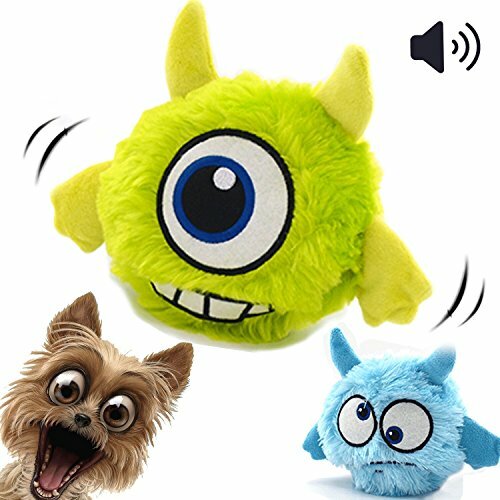 Interactive - The dog play with that by himself,when you puppy chew and tap,the button in the ball will ON,then the toy will shake and scream about 10 seconds, that will interactive your puppy playing and hunting. Automatic- The toy designed to be auto stop after 10 seconds,it only ON once your puppy tap or bite the button in the ball. Fun And Washable - The plush cover is soft and durable, 2 plush covers for replacement and washable, longer use time. And the ball is simulated puppy sound, will just like a friend play with your puppy. Exercise -The toy will accompany your dog when you are not available, also could help your puppy exercise more. If you have any questions about this product by FIRIK, contact us by completing and submitting the form below. If you are looking for a specif part number, please include it with your message.